The European Union is inching closer to enacting sweeping copyright legislation that would require platforms like Google, Facebook to pay publishers for the privilege of displaying their content to users, as well as monitoring copyright infringement by users on the sites and services they manage. As you can see, the page looks empty, because it’s been stripped of all copyrighted content – headlines, summaries and images from articles from various publishers. 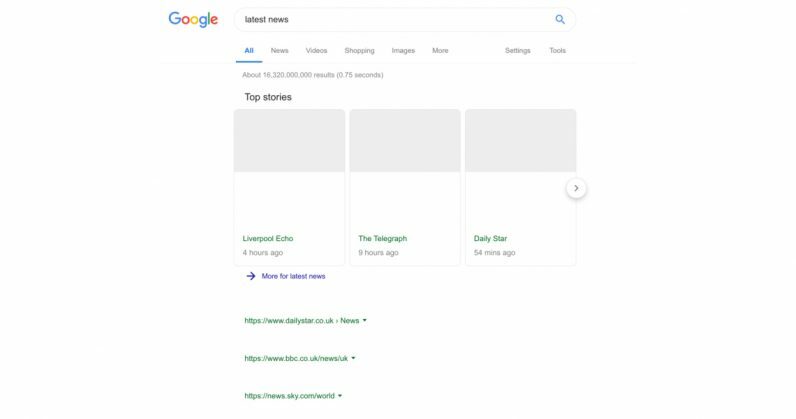 Google almost certainly won’t display unusable results like these, but it will probably only feature content from publishers it’s cut deals with (and it’s safe to assume that’s easier for larger companies than small ones). That would reduce the number of sources of information you’ll be able to discover through the search engine, and it’ll likely lead to a drop in traffic for media outlets. It’s a lose-lose situation, and it’s baffling that EU lawmakers don’t see this as a problem – possibly because they’re fixated on how this ‘solution’ could theoretically benefit content creators and copyright holders by ruling that they must be paid for their output. It isn’t yet clear when the new copyright directive will come into play – there are numerous processes involved that could take until 2021 before it’s implemented in EU countries’ national laws. Hopefully, the union’s legislators will see sense well before that and put a stop to this madness. Update: We’ve clarified in our headline that this is Google’s opinion of how its search service will be affected by the upcoming EU copyright directive; it isn’t yet clear how it will eventually be implemented.